Edna Edmundson, daughter of Harvey Gamble Edmundson and Alice Caroline Straight, was born May 6, 1887, at New Market, Taylor Co. Iowa, and died June 23, 1981 in Bedford, Taylor Co., Iowa. 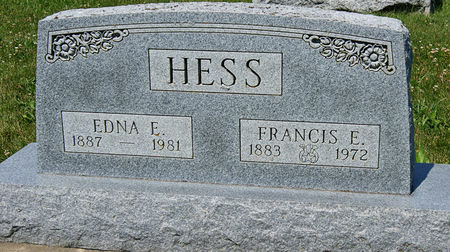 She married Francis Eugene Hess Oct. 31, 1916 at Bedford, Taylor Co., Iowa. Source of marriage date and place: Bedford Free Press, Nov. 7 & 14, 1916. They divorced in 1917 ( Source: Bedford Free Press, May 2 & 9, 1917) and remarried in 1964. Source: Bedford Times-Press, Nov.5, 1964. He was born April 15, 1883 at Bedford, Taylor Co., Iowa, son of Charles Conrad Hess and Mary Elizabeth Johnson, and died April 5, 1972 at Bedford, Taylor Co., Iowa. Searching for FRANCIS EUGENE HESS in Taylor County Iowa?